Conservative leader Tim Hudak got exactly what he deserved. On June 12 Ontario voters rejected his plan to eliminate 100,000 public sector jobs and to gut the unions. For the most part, labour’s campaign to stop Hudak worked. The Tories were trounced at the polls, reduced to 28 seats and 31 per cent of the ballots cast. 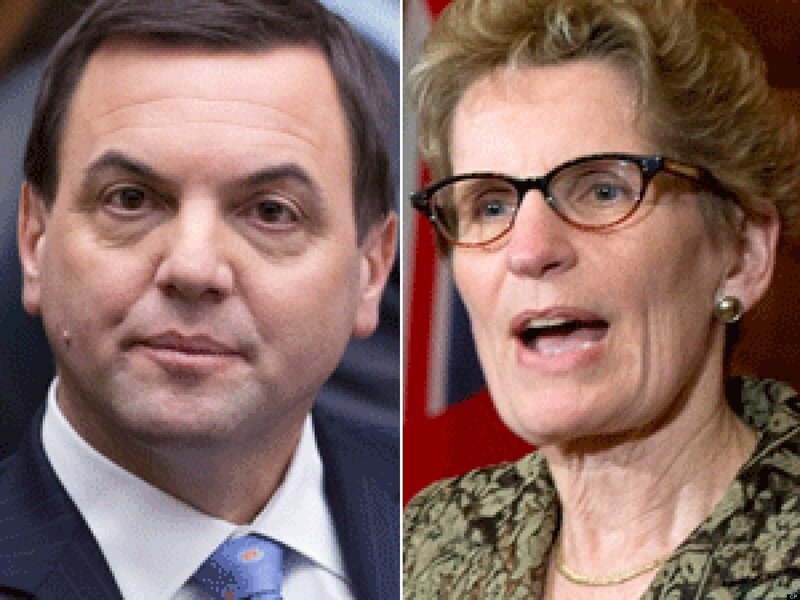 Hudak announced he’d step down when his party picks a replacement leader. But members of his caucus forced him to quit sooner. It couldn’t happen to a nicer guy! However, this anti-Hudak sentiment translated into a Liberal majority. It’s hard to celebrate four more years of Bay Street’s preferred party. It’s hard to celebrate an electoral system that rewards a party that got less than 39 per cent of the votes cast, only about 19 per cent of the eligible electorate, with a majority of seats (58 of 107) in the Ontario Legislature. The union-based New Democratic Party, on the other hand, lost the little power it had – despite increasing its vote share by 1 per cent (to 24 per cent) and retaining a seat total of 21. It would have done better had it pulled the plug on Liberal Premier Kathleen Wynne one year earlier. But the NDP did manage to pick up seats and consolidate its hold in the areas hardest hit by recession. In St. Catherines, in Hamilton (although NDP Leader Andrea Horwath did lose votes in her own riding), in London, Niagara, Oshawa and Windsor Essex regions the party had seat gains or vote increases. Still, the NDP lost three seats and major ground in Toronto. The voter turnout was barely 51 per cent, a three per cent improvement from the 2011 provincial election, but a dismal result by any standard. Key to the disappointment was the NDP’s feckless effort. Worse than losing ‘an electoral gamble’, Andrea Horwath waged the worst NDP campaign since Bob Rae attempted to defend his infamous Social Contract in 1995. Horwath had no mandate to veer to the right of the Liberal Party in a vain attempt to appeal to Conservative supporters and the business class. She had no mandate to abandon the fight for social justice in favour of a crass appeal to consumerism. The NDP platform emphasized “making life more affordable” by removing the HST from electricity bills, reducing car insurance rates by 15%, opening up a few more child care spaces, shortening hospital wait times, and offering a mere $1 increase in the hourly minimum wage. At the same time, Horwath campaigned to continue the practice of bribing big private corporations to create jobs – without demanding any public ownership or democratic control of state investment. Horwath projected a small increase in corporate taxation, but no plan to conscript the hidden, un-taxed billions of dollars – what a former head of the Bank of Canada calls ‘dead Capital’. That means the NDP proposed no way to fund a serious assault on poverty, on homelessness, or to end the deeping crises in public transit, education and health care. Horwath and her strategists said nothing about phasing out nuclear power plants, stopping Line 9, satisfying the just claims of indigenous peoples, curtailing state surveillance, and terminating police repression of the kind that was unleashed during the G-20 Summit in Toronto. There was not even a hint that the problems faced today by the vast majority of Ontarions are rooted in the decaying and increasingly destructive capitalist system — much less that the solution is socialist democracy. The ONDP Leader campaigned on ‘integrity’. But she failed to reduce her own democratic deficit. She ignored a party convention decision to be tougher on the Ontario Liberal budget of 2012/13. In fact, on her watch, party conventions provide less time for policy debate. And Horwath’s Election Planning Committee undemocratically prevents leftists from being NDP candidates. While it is gratifying that the Progressive Conservatives lost big time, it is clear that the capitalist austerity agenda continues vigorously under Premier Wynne. Remember, Wynne bragged during the TV leaders’ debate that she had implemented “80 per cent of the Drummond Report” — a harsh austerity plan. Behind Wynne’s affable smile, the locomotive of the rulers’ public sector wage freeze, social cutbacks, 3Ps, and privatization remains firmly on track. Corporate Ontario found a way to sanitize its brutal anti-working class agenda by hiding it behind the ‘progressive’ veneer of the province’s first female Premier, also Canada’s first lesbian Premier. Now New Democrats, labour unionists, feminists, LGBTQ folks, environmentalists, socialists and social justice advocates must fight to take the NDP from the latter-day Blairites, and re-direct the party to lead the battle against capitalist austerity, and for socialist solutions to the mounting problems we face. That starts with the demand that Ontario NDP Leader Andrea Horwath resign immediately. It’s time for a full review of the party’s leadership and political direction, leading up to its November 14-16 convention in Toronto. The question of Horwath’s future as ONDP leader is posed daily in the mass media. The Socialist Caucus did not initiate this question, but it does have the opportunity to rally opinion behind a concrete proposal. Robin Sears and Brian Topp have written articles in defense of Horwath. Dave Cooke, former NDP Education Minister, Gerry Caplan, Paul Ferriera, Michael Prue, even Rosario Marchese have sharply criticized her. For socialists, the main issue is not personality; it is the need for a full review of the leadership and political direction of the party. But how do we get it? This is not an abstract matter. A full review is triggered by a vote of non-confidence in the leader. A confidence vote occurs at every party convention. If even 35% of the delegates vote for a leadership review (that is, if less than 65% vote to support the current leader), in all likelihood a leadership race will ensue. It is clear that such a vote would open up a period of intense discussion about the future of the NDP. So, what should socialists and labour activists do? Should we just wait to see what happens, and in the meantime conduct ‘business as usual’ by submitting resolutions to the Convention, knowing full well that party officials will ensure that few of our resolutions ever make it to the floor? This is where a bold initiative is needed – to galvanize the widespread discontent in the party and its voter base by posing a concrete course of action: Demand that Andrea resign, and insist that a full review of the political direction of the party take place now. Is there a risk that such a demand may upset a section of the membership? Well, yes, but which section of members is likely to be offended? Will it be supporters of the openly critical letter of the 34 prominent present and former NDPers? Or that part of the labour section which openly broke with Andrea the day the election was called? Or the mass of party members who were so dissatisfied with Andrea’s campaign that they did not participate in it? Of course, there is the segment, including party staff and paid canvassers, who heartily support making the NDP the New Liberal Party – but the left has few prospects among them. Naturally, the removal of Andrea is no guarantee that another MPP in the top job will change direction. But what are the chances if the party ranks, including the SC, do not demand this? It would only help Horwath and her team of handlers and fixers to weather the storm. Our task is to ‘fan the flames of discontent.’ On what basis should we demand a full review of the political direction of the party, starting with the demand that the Leader resign? It should be done on the basis that there was no mandate to turn right; indeed, that to survive the NDP must turn sharply to the left. What should be said to those who argue that it’s time to launch a new electoral party of the left? Stand up and fight for your principles – but fight where it really matters. Don’t retreat into a fantasy world. What is the record of new left-party initiatives in English Canada? It ranges from tragedy to farce. The Waffle movement had 10,000 NDP supporters in the early 1970s. But within three years of its departure from the NDP, it had disappeared. The Campaign for an Activist Party, and later the New Politics Initiative, led by Svend Robinson and Judy Rebick in the 1990s, were top-down, undemocratic structures that gave up the fight and disappeared. Four years ago a small body of dissident NDPers launched the Ginger Group. After a brief polemic, it quit the NDP and launched the Socialist Party of Ontario. In 2011 it ran three candidates. On June 12, 2014 the SPO ran only two candidates. The Communist Party of Canada ran 11 candidates on a left-reformist platform. None of those ‘left’ candidates got more than 200 votes. The NDP got 1.1 million votes, with no support from big business. Most of its votes came from working people in heavily working class districts. Then there is the left-populist or anarchist perspective. It says “Just ignore the NDP”. The problem with that is many-fold. It is economist. It leaves the struggle for bread and butter improvements at the front door of the Legislature. It is anti-political, or at best, a stunted form of politics. Worst of all, it gives the present leadership of the working class a free hand to continue the sell-out. That includes so-called strategic voting, which favours the Liberal Party. We saw what that means when Gerry Dias, the President of UNIFOR, was shown on TV at the Liberal victory party congratulating Kathleen Wynne. The NDP is the only mass, labour-based political party in North America. To understand the significance of that, just look at politics in the United States. The NDP remains a workers’ party, which is obvious to anyone who has been to an NDP convention. But the NDP has a staunchly pro-capitalist leadership which is out of step with reality, that is, seemingly oblivious to the extremely destructive decline of late capitalism. The struggle for a Workers’ Agenda will take place in the NDP, as it will take place in the unions. Not exclusively there, but there too. Let’s hope that there will be confrontations – arising from resistence to the coming cuts. Let’s hope that union leaders don’t declare victory over Hudak and then go to sleep, as they did when the Bob Rae-led Ontario NDP surprisingly won a majority of seats in 1990. One thing should be clear: for anti-austerity resistence to succeed there must be rank and file organization against austerity and concessions inside the NDP and the unions. A critical test of that idea will occur at the Ontario NDP Convention in November. To prepare for that, the Socialist Caucus will host an Ontario Conference on Saturday, September 6. It will petition for a change of leadership and political direction of the party. It will decide on priority resolutions. It will select SC candidates for the ONDP Executive. It will plan the next edition of Turn Left, the SC magazine, for which a fund appeal is presently underway. Can the Socialist Caucus make a difference? It has proven that it can. The SC won the federal NDP in 2006 to the policy ‘Canada Out of Afghanistan’. 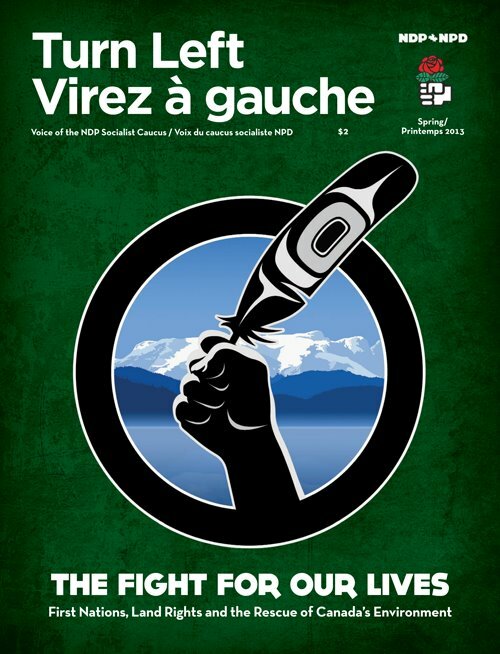 The SC led the fight at the 2011 NDP convention in Vancouver to keep ‘socialism’ in the party constitution, and again at the 2013 convention where we won the debate on ‘free post-secondary education’. We forced the Ontario party leadership in 2010 to conduct a review of public funding of Catholic separate schools, and held the only large public hearing on the issue. Clearly, socialist revolution requires more than socialist resolutions. But change starts with joining the fight inside the main working class organizations. Capitalism has nothing to offer workers, women, youths, seniors and the poor. The Occupy movement showed there is a hunger for change, and re-defined the notion of ‘majority.’ The Quebec students’ movement showed what a mass ‘social strike’ against neo-liberalism looks like. The current continental campaign for a $15/hour minimum wage inspires millions. Opposition to Line 9, to the Northern Gateway pipeline, and the fight to save Canada’s postal services have the same potential. The global popularity of Thomas Piketty’s book ‘Capital in the Twenty-First Century’ indicates the wide disdain for growing inequality, and the appetite for a radical new direction. The defeat of Ken Georgetti’s executive slate at the Canadian Labour Congress Convention in May is further evidence of stirrings below the surface. In our tortured world, anger and suffering there is aplenty. What’s lacking is leadership. Leadership is born in struggle. Join the struggle for a new leadership in the workers’ movement. Join the NDP Socialist Caucus. Together we will win. Sign the petition! Spread the word! !